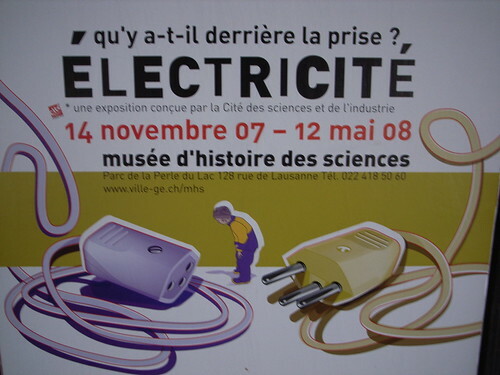 Where the first picture is a book about studies concerning social representations of "electricity", the second is about an exhibit about "what's behind the electric power plug"
"Many, often remarkable, works have sought to study the representations of a society, on the one hand, and its modes of behavior, on the other. Building on our knowledge of these social phenomena, it seems both possible and necessary to determine the use to which they are put by groups or individuals. For example, the analysis of the images broadcast by television (representation) and of the time spent watching television (behavior) should be complemented by a study of what the cultural consumer "makes" or "does" during this time and with these images. The same goes for the use of urban space, the products purchased in the supermarket, the stories and legends distributed by the newspapers, and so on." Why do I blog this? 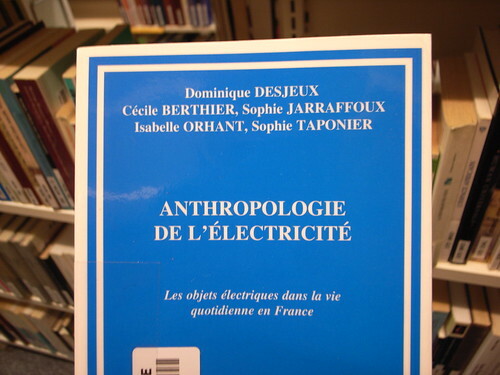 Electrical infrastructure and usage of electricity, an interesting topic for a cold sunday. The fact that I encountered these 2 elements on the same afternoon is definitely no coincidence, it's definitely that I have an interest towards a such topic. Should dig it in the future. Why de Certeau here? because it might be a starting point.